UPrinting is a leading socially responsible online printing company. They’ve been online since 2000 and the company has been established as a major player in the industry. UPrinting serves thousands of on-demand printing using high-quality press printing and a robust yet simple and easy-to-use online ordering system. They deliver high-end printing services and reliable color printing. UPrinting offers a wide variety of products from business cards, brochures, envelopes, greeting cards, posters, canvas prints and many more. They are specifically proud of our high-quality and eco-friendly prints. UPrinting boasts their eco-friendly printing that uses recycled paper types and vegetable/soy-based inks with lower levels of VOCs than traditional petroleum-based inks to reduce harmful carbon emissions. 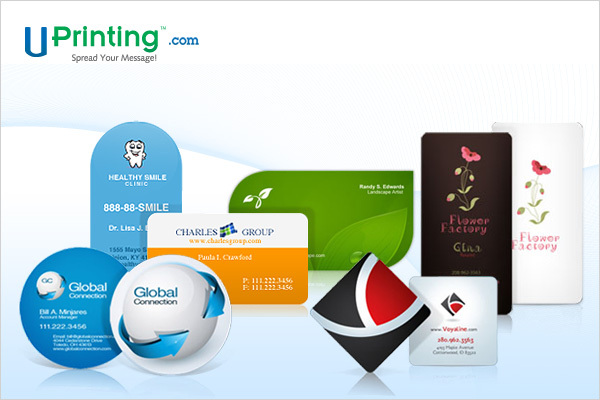 UPrinting offers two type of business cards: standard business cards and die-cut business cards. Here are the specs for our die-cut business cards: Sizes to choose from :2 x 3.5″ Rounded Corners, 2×2″ Rounded Corners, 1.75×3.5″ Rounded Corners, 2×3.5″ Leaf, 2×3.5, Rounded one corner, 2×3.5″ Half Circle Side, 2×3.5″ Oval, 2.5″ Circle. Paper to choose from : 14pt Cardstock Gloss / Matte / High Gloss (UV), or 13pt Cardstock Uncoated, 6 Business Days Turnaround.